What Else Can I Expect From an Online Master's in Special Education Program? Those in special education (SpEd) teach and provide supportive services to students with physical, cognitive, emotional, and behavioral disabilities. At most public elementary and secondary schools, these teachers instruct students with special needs in dedicated classrooms. BLS data indicates that 51% of special education employees hold a master's degree, while only 33% have only a bachelor's. Many students require full-time special education support, while others spend most of their time in a standard classroom to receive supplemental SpEd instruction for one or two periods per day. In addition to class instruction, SpEd teachers must prepare independent education profiles for each student, working with them to overcome educational obstacles related to their disability. SpEd teachers also meet regularly with the parents of their students to discuss academic progress or behavioral problems. In some cases, special education teachers also work with exceptionally gifted students. In the U.S., special education teachers at public schools must earn a state-issued teaching license; many private schools also require licensure. According to the Bureau of Labor Statistics (BLS), a bachelor's degree serves as the minimum requirement for jobs in special education. However, most prospective SpEd teachers earn a master's degree in special education. Some pursue a master's specifically dedicated to special education studies, while others follow a degree track in elementary or secondary education with a specialization in special education. Many of today's students earn their master's degree in special education online rather than on campus. The flexible format inherent in online learning proves especially convenient for students who must balance their schoolwork with other commitments, such as childcare or a full-time job. 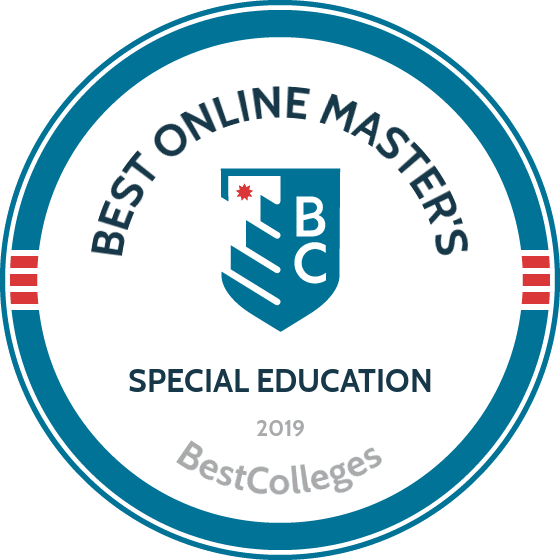 Below, you can learn more about online master's degrees in special education and the career opportunities available to graduates in the field. WILL AN ONLINE MASTER'S IN SPECIAL EDUCATION PROGRAM PROVIDE ME WITH THE SKILLS I NEED TO ADVANCE MY CAREER? Students trained in special education can teach, provide therapy, and develop programs for students with special needs. Intensive graduate-level courses introduce students to curriculum design, assessment and communication techniques, and classroom management strategies for students with learning and behavioral disabilities. Many programs emphasize teaching strategies for students with specific disabilities, such as autism spectrum disorder, ADD/ADHD, and mental retardation. Special education master's programs also include onsite practicum components, allowing students to receive supervised training from established SpEd teachers in real-world classrooms. WILL AN ONLINE MASTER'S IN SPECIAL EDUCATION WORK WITH MY SCHEDULE? Online master's programs in special education work around a student's schedule. Most curricula follow an asynchronous timetable, allowing students to complete course requirements on their own time from the comfort of their home. Current technology also allows them to study away from their desk using a laptop, tablet, smartphone or other device with Wi-Fi accessibility. For added convenience, online students can often coordinate practicum courses at local schools near their current residence. WHAT JOBS CAN I GET WITH MY MASTER'S IN SPECIAL EDUCATION? A master's degree in special education qualifies graduates for most entry-level SpEd teaching positions, although candidates for public school jobs also need a teaching license in the state where they plan to work. In addition to teacher training, the best online special education master's programs also prepare students for their state's licensure exam and online special education certification requirements. WHAT ARE THE BEST ONLINE MASTER'S IN SPECIAL EDUCATION PROGRAMS? Finding the right program can prove difficult, and only you can properly evaluate whether a target school's strengths match your educational needs. The following ranked list of schools should serve as a helpful starting point in your search for the best online master's in special education programs in the U.S. Those considering obtaining a master's in special education online should consider these programs. The University of Washington offers an online special education master's from its campus in Seattle. Studying part time, students can earn their master of education in special education: applied behavior analysis in two years, fully prepared to sit for the Behavior Analyst Certification Board (BACB) exam upon graduation. UW's online program consists of two parts: 27 credits within the BACB verified course sequence -- which prepares students to become a board certified behavior analyst -- and an additional 18 credits for students who want to earn their master's in special education. Course highlights include educating students with autism and a tiered approach to inclusive instruction. To meet BACB requirements, students must complete an intensive practicum experience -- 750 hours in an environment that applies behavior analytic methods in special education. The program also requires each student to complete a capstone project, culminating in an in-person presentation at UW's annual Student Capstone Conference held in the spring. Each BACB and master's degree course in UW's applied behavior analysis program adheres to a synchronous learning format, which requires all students to login weekly at a set time to participate in lectures, class discussion, and group activities. New programs start each fall semester. To apply, prospective students must submit GRE scores, a current academic/professional resume, two letters of recommendation, transcripts, and a statement of purpose. Applicants may also need to complete an interview and/or supply writing samples. Through its Teach Well Online Academy, the University of Florida offers flexible special education master's programs online that feature several specialization or track options: autism, disabilities in society, dyslexia, and early childhood studies. Designed for part-time enrollment, the 36-credit program offers a completion time of two years if students take two classes each spring, summer, and fall semester. Twelve credit hours fulfill the Teach Well Core required of every student. The remaining 24 credits come from specialization courses. Students may fulfill the 24-credit requirement either by completing a single specialization track of four courses (five in the dyslexia track) or by selecting a combination of courses from multiple tracks. Specialization courses offer a sophisticated study of topics, including social perspectives on disability, dyslexia intervention methods, and the nature of autism. All classes deliver material in an asynchronous online format. Students never need to come to campus. Although nonresidents of Florida pay a few additional flat fees per credit hour, both resident and nonresident students receive the same base tuition rates. UF accepts applications to this program on a rolling basis. Prospective students must submit materials including a resume, transcripts, three letters of recommendation, and GRE scores. Students interested in the disabilities in society track, dyslexia track, or early childhood education track must submit a certificate admissions application in addition to UF's graduate application. Students looking for online special education master's programs with licensure preparation in North Carolina need look no further than the master of arts in teaching-special education (MAT) at North Carolina State University. Offered in hybrid form, students complete the 33-credit degree plan through a mix of online and face-to-face classes on campus. Designed for students without teaching certification, NC State's MAT program caters to aspiring teachers with a bachelor's degree outside the education field. Graduates earn an initial North Carolina teaching license along with their master's degree. During the program, students complete six core courses and six speciality courses, including teaching functional and life skills to students with disabilities, intervention for behavioral problems of students with disabilities, and a seminar in special education literacy. After students complete at least 21 credit hours, they can begin the program's teaching internship, which requires a minimum of 10 consecutive weeks of full-time work in an elementary, middle school, or secondary school classroom. Applicants must possess at least six college credit hours in each of the following content areas: English, social studies, math, and science. Those who do not meet content area requirements can complete them as a non-degree student at NC State prior to admission. Additional application requirements include a bachelor's degree from a regionally accredited institution and a 3.0 minimum GPA. Students with a GPA below 3.0 must submit GRE scores. Students don't need to be on the ground in Tampa to pursue a degree at the University of South Florida. USF offers an accredited online master of arts in exceptional special education. Specializations include behavior disorders, learning disabilities, intellectual disabilities, and exceptional student education. In this customizable master of arts, students complete several common core courses, including instructional approaches for exceptional populations and management and motivation of exceptional and at-risk students. Then, they select a specialization, each of which consists of one advanced theory course and two electives -- excluding the exceptional student education focus, which requires three theory courses. Finally, students earn credit hours from a required independent study course and practicum. Before graduation, students must complete a comprehensive exam to ensure mastery of the program's learning outcomes. To apply, prospective students must possess a bachelor's degree from an accredited institution and supply a letter of recommendation and statement of purpose. They must also indicate their likelihood to succeed in the program by fulfilling one of the following criteria: a previous graduate degree, an undergraduate GPA of 3.0, completion of nine previous graduate credit hours in special education with a 3.0 GPA and faculty endorsement, or adequate GRE scores (154 verbal, 143 quantitative, and 4.5 in analytical writing). TAMU offers two options for individuals looking to earn an online master's degree in special education: a master of education and a master of science. Each degree plan requires the completion of at least 36 credit hours, allows students to complete all requirements entirely online, and fulfills the coursework requirements needed to pursue certification from the Behavior Analyst Certification Board. In addition to more unique courses like bilingual special education, TAMU courses cover core concepts like behavior management, assessment, and adolescent literacy. Each sequential class in the program adheres to a strict, synchronous format that requires students to attend online lectures and activities at set times, typically three hours per week per class in the evenings. Master of education candidates must successfully complete a comprehensive exam before qualifying for graduation. Generally, students complete curriculum components in two years, but learners who decide to pursue a master of science must complete a thesis in addition to all standard coursework, which may increase overall degree length. Prospective students do not need teaching certification, but the admissions department highly prefers applicants with previous teaching and/or work experience with individuals with disabilities. New cohorts begin the program each summer, requiring applicants to submit all materials for consideration no later than TAMU's spring semester. Applicants do not need to provide GRE scores, but candidates must submit college transcripts, a candidate statement, letters of recommendation, and, if desired, other supplemental documentation such as a resume. A private institution based in Salt Lake City, Utah, Western Governors University offers a master of science in special education K-12 online for educators who already possess their teacher certification. Completing this master of science offers a direct path to special education roles, training educators to teach and work with K-12 students who experience disabilities. WGU charges tuition by term, not by credit hour, meaning all students pay the same amount, and students can save money by completing their degree in a timely manner. Average degree completion times range from 9-26 months. The program's 12 courses cover subjects in special education, instructional design, and research. Before graduation, students must also complete a practicum experience, a teacher work sample, and a Praxis Subject Assessment. The practicum requires 240 hours of in-class supervised teaching of special education students. A successful teacher work sample includes a written project and oral defense. The Praxis Subject Assessment application takes roughly two hours to complete and requires a fee. WGU holds classes asynchronously, allowing students to login at any time to complete course components. To provide further flexibility to its students, WGU accepts applications on a rolling basis for all online programs and offers class start dates on the first of every month. Applicants to the special education master's program must supply undergraduate transcripts verifying receipt of a bachelor's degree and a copy of a valid teaching license. George Washington University's master of arts in education and human development in special education for culturally and linguistically diverse learners boasts a variety of developed skills and learning outcomes. One of only eight programs like it in the country, this standout master's in special education online offers a pathway to roles in special education for currently employed teachers with initial certification. The 33-credit program offers completion times in as few as 1.5 years. It emphasizes a theory-to-practice curriculum to prepare educators to work closely not only with students from diverse cultural and linguistic backgrounds, but also students facing social or learning disabilities. The core curriculum features classes including the development of language and literacy, linguistic applications in English as a second language, and the academic and psychosocial assessment of culturally and linguistically diverse students. Graduates possess the experience of a full-time, field-based teaching internship and can sit for the ESOL Praxis and SPED Praxis exams. Students complete their flexible degree in a cohort, with asynchronous access to lectures and course materials and the ability to connect to professors and peers in real time. GW accepts new candidates into its special education master's program in the summer and fall, requiring applicants to adhere to firm admission deadlines. Prospective applicants must possess a bachelor's degree, submit an online application, and provide materials including a resume, statement of purpose, two letters of recommendation, and unofficial transcripts detailing previous undergraduate and/or graduate education. Featuring specialization courses leading to a Florida Autism Endorsement, Florida International University's master of science in special education-autism endorsement online provides professionals with the tools and knowledge required to work with students on the autism spectrum and with culturally and linguistically diverse learners. Consisting of six accelerated terms lasting eight weeks each, this 36-credit program offers a rapid completion time of only one year. FIU offers program start dates in the fall and summer. Among the program's 12 required courses, students study advanced theory and research in special education, nature and needs of students with autism spectrum disorder, and working with families of students with disabilities through collaborative approaches. Students can complete all course components in an online environment. However, program candidates must retain access to an academic setting and a group of K-12 students or K-12 teachers throughout the program in order to complete a required action research project. To qualify for admission, applicants must possess a bachelor's degree with a 3.0 minimum GPA in upper-division coursework and provide a current resume, three letters of recommendation, official college transcripts, and either a valid teacher certification in exceptional student education or a valid letter of eligibility confirming a passing score on a teaching certification exam in exceptional student education. Whether a Florida resident, nonresident, or international learner, all accepted students receive the same low tuition cost and may qualify for an additional online academic merit scholarship. Brandman University offers five special education master's programs online, with concentrations in advanced methodology, autism, behavior analysis, teaching and learning, and early childhood special education. Each program requires the completion of 30-36 credits: 18 credits of core coursework and 12-18 credits of electives related to the student's emphasis. As part of the special education core, students must also complete a capstone course, offering students a variety of project options to study, present, and discuss evidence-based practices and their own professional development. Core courses in Brandman's master's programs include the in depth study of leadership and policy in special education, program development and organization in special education, and collaboration in special education. Electives primarily consist of lecture courses to develop enhanced skills and knowledge within the emphasis area. Exceptions include the early childhood special education emphasis -- which gives students the option to take a field experience course -- and the behavior analysis emphasis, which requires students to retain at least part-time employment in the field while using behavior analysis. Each special education master's program at Brandman adheres to the same general admission requirements. Students must provide a completed application, two letters of recommendation, and official transcripts; they must also meet minimum GPA requirements and hold a special education teaching credential. Applicants without the latter credential may complete a course on collaboration for inclusive schooling. All students pay the same per-credit tuition rate regardless of state residency. Michigan State University offers an online master of arts in special education with emphases in learning disabilities and autism spectrum disorders. If desired, students can also pursue a separate, six-course graduate certificate in applied behavior analysis during their time at MSU. Each online course in the department of education caps at 25 students to ensure personalized interaction with professors. Graduates develop the knowledge and skills required to successfully educate K-12 students with disabilities. To graduate from this master of arts program, students must complete 30-36 credits of core, specialization, and elective courses. MSU's curriculum emphasizes evidence-based practice and research-validated instruction, offering study of important concepts including classroom and behavior management, content area instruction for students with mild disabilities, and technology and literacy for students with mild disabilities. Before graduation, each master's candidate completes a comprehensive examination and a field experience practicum requiring up to 180 contact hours, depending on chosen emphasis. MSU accepts new students into its program once a year in the spring. Applicants must submit a goal statement, three letters of recommendation, transcripts, and a copy of valid teaching certification. Although the program does not require GRE or MAT tests, applicants may supply these scores if desired. The department reminds applicants that special education endorsements earned with this degree adhere to Michigan state requirements only. It remains the responsibility of the individual to investigate varying requirements and validity if he/she plans to teach in another state. Choose from eight areas of specialization when you enroll in an online master's degree in special education at Texas Tech University. Students select from focus areas in autism, applied behavior analysis, deafblindness, deaf/hard of hearing, educational diagnostician, general special education, orientation and mobility, and visual impairment. The 36-credit program offers start dates every semester, requires no hard application deadlines, and accepts up to six transfer credits for students with previous graduate-level coursework. For their culminating degree experience, students can either complete a comprehensive exam or a thesis. Specific program requirements and courses vary depending on the concentration area a student selects. Required core courses may focus on vital areas, including student assessment, issues in special education, human development, instructional strategies for teaching students with low incidence disabilities, or collaborative problem-solving in special education. The applied behavior analysis specialization meets the verified course sequence requirements of the Behavior Analyst Certification Board, increasing students' eligibility to take the Board Certified Behavior Analyst Examination. All master's degree candidates in the school of education must complete an internship in a field-based setting requiring at least 350 contact hours supervised by a faculty member. Required application materials vary, but they typically include a 3.0 minimum GPA minimum, teaching service records, and submission of a copy of a valid Texas teaching certificate, a resume, an applicant statement, and two letters of recommendation. Note that the education diagnostician concentration limits admission to Texas residents. Offering completion times as brief as 20 months, Purdue University's master of science in education in special education online prepares graduates to plan and implement special education curriculum, create a safe and productive classroom environment, and meet the needs of all students in their care. The master's program consists of a 31-credit plan. Featured core courses include introduction to educational research; identification, evaluation, and assessment of exceptional individuals; and social, legal, and ethical issues in special education. All courses adhere to an asynchronous delivery format. To enhance program flexibility, Purdue students may elect to pursue the master's alone or choose from additional licensure options: initial special education licensure or mild and/or intense intervention licensure. Each licensure track requires students to complete practicum experiences in the field. The state of Indiana currently possesses reciprocity agreements with 42 other states, meaning select nonresident students can earn licensure through this program and qualify to teach in their home state. For admission consideration, applicants must participate in a phone interview with an admissions adviser and provide materials including a resume, official transcripts, three letters of recommendation, GRE scores, and a personal statement of at least 500 words. Prospective students may receive a waiver for GRE submission requirements if they possess a 3.0 GPA in undergraduate work or already hold an advanced degree with a 3.0 GPA. For details regarding application deadlines and program start dates, prospective students can reach out to an admissions adviser. Chartered in 1826 as Hampstead Academy, Mississippi College began as one building on five acres of land in central Mississippi. The academic edifice, as the building was called, housed four rooms that were large enough to accommodate 150-200 boys and girls. It attained college status in 1830 and today enrolls more than 5,000 students from all over the country and 43 nations. U.S. News & World Report ranks Mississippi College as 32nd on the Best Regional Universities South Rankings and 16th on its Best Value Schools list. The college offers a master's in special education online through the School of Education, comprising 30 credits. An accelerated program, students can complete coursework in 10 months, with each term lasting seven weeks. Students can earn the degree completely online and graduates can apply for a special education mild/moderate K-12 endorsement on their license. Graduates are eligible for a class AA license upgrade as well. The curriculum comprises 10 courses and covers topics such as organizational procedures for special education, diagnostic/prescriptive reading, and curriculum development. M.Ed. applicants must hold a current, five-year renewable standard teaching license in elementary, secondary, or K-12 education. Students take a comprehensive exam upon completion of all coursework; students with a 3.75 GPA are exempt from the test. The School of Education is accredited by the National Council for Accreditation of Teacher Education (NCATE). At its formal inauguration in 1831, the University of Alabama enrolled 52 students. In 2018, the university enrolled more than 38,000 students worldwide. U.S. News & World Report ranks University of Alabama as 80th on the Best Value Schools list, and 129th among 312 schools in the National Universities Rankings. The university offers two special education master's programs online: master of arts in special education (collaborative 6-12 certification) and master of arts in special education (gifted and talented certification). The collaborative 6-12 master's degree requires 36 credits and follows a blended delivery system. It adheres to the university's regular course calendar and accepts applications every semester. The gifted and talented special education program comprises 30 credits, is offered primarily online, and accepts applications year-round. The program requires students to attend a four-week summer enrichment workshop during the final summer semester. The university hosts special accommodations on campus for students attending the workshop. The University of Alabama offers both programs through the Special Education and Multiple Abilities Department of the College of Education. Applicants need a bachelor's-level teaching certificate, an undergraduate GPA of at least 3.0, and a minimum score of 300 on the Miller Analogies Test. Both programs require students to undergo a practicum experience and pass a comprehensive exam prior to graduation. Founded in 1949 as the Northern Virginia University Center in Arlington, George Mason University began as a branch of the University of Virginia. In 1966, it moved to Fairfax, and by 1972, the university became an independent institution. George Mason University now enrolls around 34,000 students from more than 130 countries and operates five campuses, including one in the Songdo region in South Korea. The university's College of Education and Human Development offers an online special education master's program that comprises 30 credits. The 100% online degree is only offered on a part-time basis. Most students continue to work full time while earning the degree. Students can choose between two graduate certificate tracks: an autism spectrum disorders certificate, which is 15 credits, or an applied behavior analysis certificate, which is 18 credits. The school offers both certificates independently of the M.Ed. program. The M.Ed. follows a rolling admissions policy. Coursework consists of synchronous and asynchronous classes. Regardless of the graduate certificate track a student selects, all students must take four core courses: computer applications for special populations, introduction to special education, universal design for learning (UDL), and special education research. The UDL course may require students to undergo a field experience where they observe UDL practices in the classroom or prepare lesson plans for a student population. Students must complete a capstone project to graduate. Established in 1851, St. Joseph's University is a Jesuit institution in Philadelphia. Although it began as an all-male school with just 30 students, the university became fully coeducational in the fall of 1970 and reached university status eight years later. Today, St. Joseph's University enrolls more than 8,000 students and offers 55 undergraduate majors, 52 graduate programs, and more than 30 certificate and degree-completion programs. St. Joseph ranks 12th in the U.S. News & World Report Best Regional Universities North Rankings. Alternately, students can pursue a concentration in applied behavior analysis (36 credits). Students pursuing the special education certification need a bachelor's degree in education and Level 1 teacher certification. Students who choose the applied behavior analysis concentration are qualified to take the Board Certified Behavior Analyst Examination after completing coursework. The MSE requires 24 core credits, except for applied behavior analysis students who enroll in 12 core courses, 21 concentration courses, and an elective. Core courses cover topics such as diagnostic assessment and progress monitoring, research-based models and procedures, and foundations and current issues in special education. Established in 1869, the University of Nebraska - Lincoln boasts a 2018 enrollment of 25,820 undergraduate and graduate students from all 50 states and more than 100 countries. UNL has been accredited by the Higher Learning Commission since 1913. The university's College of Education and Human Sciences offers two online master's degrees in special education: master of arts in special education and master of education in special education. Both degrees offer three optional specializations: deaf and hard of hearing education (pre-12), early childhood special education (birth to age 5), and visual impairments (pre-12). The visual impairment specialization requires onsite attendance during summer terms. Most students seeking special education endorsements opt for the M.Ed., which comprises 36 credits. Students completing a major and minor must complete at least 18 semester hours in the major. Students who choose one major and two minors must complete at least 15 semester hours in the major. The M.Ed. does not require a thesis. Students who pursue the MA complete 30 or 36 semester hours, depending on the track. MA students can write a final thesis if it supports their educational and professional objectives. Available Concentrations: Early childhood education, education of the deaf and hard of hearing, visual impairments. Four years after founding the Indiana State Normal School Eastern Division in 1918, the Indiana General Assembly changed the name of the school to Ball Teachers College to acknowledge the generous donation of the Ball brothers to the school. In 1965, the school underwent another name change -- Ball State University -- to reflect its growth. U.S. News & World Report includes the university in the National University Rankings as 171st out of 312 schools. The university is accredited by the Higher Learning Commission through 2024. Ball State University offers a master's in special education online with nine focus areas and coursework that leads to a graduate certificate or license. The program comprises 30 credits and allows students to pursue graduate-level certificates in applied behavior analysis, autism, disabilities for postsecondary settings with an emphasis on autism, emotional and behavioral disorders, and response to intervention. Alternately, students can enroll in courses that lead to one of five license options: director of exceptional needs, early childhood special education, deaf and hard of hearing, intense interventions, and mild interventions. Students can transfer up to nine graduate credits towards their degree. The university only considers transfer credits for courses with a B grade or higher and completed within six years of the application date from an accredited institution. Most of the online courses at Ball State University follow an asynchronous delivery method. Liberty College in Lynchburg, Virginia began as a small liberal arts college in 1971 with 154 students. Today, it is known as Liberty University and comprises 17 schools and colleges, offers more than 600 programs, and educates 15,000 students. The Southern Association of Colleges and Schools Commission on Colleges granted full accreditation to the university in 1980. The School of Education at Liberty University is accredited by the National Council for Accreditation of Teacher Education through the Council for the Accreditation of Educator Preparation. The School of Education offers two special education master's programs online: master of arts in teaching - special education (MAT) and master of education in curriculum and instruction - special education. Both programs are 100% online and comprise 30 credits. Students can transfer up to 15 credits from graduate-level classes completed at accredited institutions. Students take core courses in learning theory and behavior management, curriculum fundamentals, and education assessment and intervention. The MAT program prepares students for initial teaching licensure. The M.Ed. program focuses on teaching and curriculum development in a special education setting. Core courses cover topics such as technology and diversity, characteristics and assessment of autism spectrum disorder, and inclusive classroom creation. Online students can access various academic resources, including more than 750,000 electronic books and journals, an online writing center, and several online student groups. Six women and two men comprised the first graduating class of the University of North Dakota, an institution founded in 1883. The school consisted of a few acres of property and one building that housed the classrooms, offices, library, and student dormitory. Today, the University of North Dakota sits on 521 acres, consists of 240 buildings, and boasts a population of 15,000 students. UND is fully accredited by the Higher Learning Commission. UND offers two online special education master's programs through the Department of Teaching, Learning, and Professional Practice of the College of Education and Human Development. The master of education in special education is designed for students with an undergraduate degree in a non-education field. Coursework covers topics such as the psychological foundations of education, inclusive methods, and multicultural education. Students with a bachelor's degree in an education field often pursue the master of science in special education. The curriculum includes courses in assessment and behavior change systems, progress monitoring, behavior management, and research methods in behavior analysis. Both programs are 100% online and comprise 32 credits. Most students graduate in under two years. Students accepted to either program can choose from nine specializations, including applied behavior analysis, autism spectrum disorders, and early childhood special education. Students can complete a scholarly project or write a thesis to earn their degree. Georgia College and State University began as a two-year college in 1889. The all-women school, then known as Georgia Normal and Industrial College, followed a curriculum focused on teacher training and business skills. The college began admitting men in 1967. Georgia College now enrolls more than 6,600 undergraduate and graduate students and offers more than 40 majors. U.S. News & World Report ranked Georgia College 28th in the Best Regional Universities South Rankings. The university is accredited by the Southern Association of Colleges and Schools Commission on Colleges. Georgia College offers two online master's degrees in special education: master of arts in teaching in special education (MAT) and master of education in special education. Both programs are partially online and follow a cohort learning model. The College of Education requires all applicants to take the Georgia College Graduate Writing Assessment and the GRE or the Miller Analogies Test. To graduate from either program, students must complete a capstone project. Teachers with a Georgia Level 4 teaching certificate often enroll in the M.Ed. program. The degree comprises 36 semester hours and students must complete it within six years of initial enrollment. Courses include applied behavior analysis, advanced classroom management, legal issues in special education, and research on behavioral issues. The MAT program is designed for students seeking initial certification in special education. Applicants need a bachelor's degree from an accredited college or university. The program consists of 42 semester hours and does not accept credits from another institution. The curriculum includes courses on behavior management, language development, literacy for special education, and literacy strategies and instruction. The University of Texas started out as Houston Junior College in 1927. Initial enrollment consisted of 232 students under the tutelage of 12 faculty members. The school became a university in 1933 and, a year later, changed its name to the University of Houston. The university is accredited by the Southern Association of Colleges and Schools Commission on Colleges. U.S. News & World Report ranks the University of Houston 19th on the Best Online Graduate Education Programs report. The university's College of Education offers a master of education in special populations with an emphasis on special education. The fully online special education master's degree comprises 30 credits and follows a cohort learning model. Full-time students usually earn the degree in two years. Students who are not seeking further certification typically graduate from the program by passing a written exam. Students seeking certification take the appropriate TExES Certification exam for their emphasis. Although the M.Ed. prepares students to take the exam, certificate candidates may need to enroll in specific courses to receive exam eligibility. All students take three core courses: principles of human learning, students with disabilities, and introduction to educational and psychological measurement. The special education emphasis includes courses in instructional interventions, the psychological processes of reading, current technology in special education, and evidence-based instructional interventions. Founded as Watauga Academy in 1899, the school became a full-fledged university offering diverse undergraduate and graduate degrees in 1971. Appalachian State is accredited by the Commission on Colleges of the Southern Association of Colleges and Schools. The school is ranked 8th in U.S. News & World Report Best Regional Universities South Rankings. Appalachian's graduate education programs ranked 77th on the Best Online Graduate Education Programs Rankings. Although Appalachian's master's degree in special education is primarily a classroom-based program, it hosts online components and pre-arranged online class sessions. The 36-credit degree leads to licensure or certification for professionals practicing in North Carolina. Other states may hold additional licensure or certification requirements. Applicants need a bachelor's degree from an accredited college or university and test scores from either the GRE or Miller Analogies Test that are no more than five years old. Students can choose from three concentrations: emotional/behavioral disorders, intellectual disabilities, or learning disabilities. Regardless of the concentration, all students take courses in product of learning, special education law and leadership, and classroom management for effective instruction. Students must also complete a research course. Students submit a professional portfolio as the final learning experience. Loretto College became Webster College in 1924 and Webster University in 1983, reflecting the school's growth. U.S. News & World Report ranks the university 23rd in the Best Regional Universities Midwest Rankings. Webster University has been accredited by the Higher Learning Commission since 1925. The university's School of Education offers a master's in special education online. The degree comprises 33 credit hours and six emphasis areas: applied behavior analysis, emotional and behavior disorders, inclusive education, mild/moderate disabilities, positive behavioral interventions and supports, and severe developmental disabilities. Core coursework covers topics such as global issues in special education, assessment evaluation, collaborative practice, and research and inquiry. Students can transfer a maximum of six credits from another Webster University program as long as the credits were not applied toward the requirements of another degree. Generally, the school does not accept transfer credits from other institutions, although students can apply for a waiver on a case-by-case basis. Founded in 1839, the University of Missouri was the first public university established west of the Mississippi River. MU's current roster of 30,000 students come from all 50 states and more than 100 countries. The university offers more than 300 degrees through 19 colleges and schools. U.S. News & World Report ranks MU 38th on the Best Online Graduate Education Programs Rankings. MU's College of Education offers a special education master's program online without any on-campus requirements. The program consists of 33 credits, 27 of which must come from special education coursework. The curriculum includes courses such as introduction to applied statistics, assessment and evaluation in special education, research with exceptional children, and methods in cross-categorical special education. Students must pass a take-home exam to earn the degree. The exam covers all course content. Students have two weeks to complete the exam. Applicants need a bachelor's degree from an accredited college or university and at least a 3.0 GPA in the last 60 hours of their undergraduate education. Applicants must submit GRE scores received no more than five years from the application date. Dr. Barbara Hong obtained three masters and a Ph.D. from Columbia in special education, policy, and administration, and as a learning specialist. In addition to receiving the Senior Fulbright Scholar, Senior Fulbright Specialist, and Fulbright Hays awards, Hong is also an appointed speaker specialist and expert on disability for the US State Department. Dr. Hong's research examines the cognitive science of teaching and learning and the development of self-determination through the ethic of caring. She is the founder and director of PACETM -- Parents as Advocates for Change in Education. Why did you choose a career in special education? Was this something you were always interested in? As an undergraduate, I needed a job. One day, I saw a bulletin that was seeking a research assistant to help start the special ed program at BYU-Hawaii and to get it accredited. I knew NOTHING about education in the US, let alone about special education or disabilities for that matter. The professor was willing to take a chance on me and, eventually, I decided to major in special ed. I went on to pursue my passion by earning three masters and a Ph.D., and have since taught in the field for the past 16 years. What are some of the most crucial skills you gained in your studies that apply to teaching on a day-to-day basis? Be Reflective -- make sure you are constantly inspecting your own teaching on how best to deliver the contents. Be Empathetic -- an effective teacher is one who puts herself in the shoes of the students and sees where they are coming from in learning the concept. Be Fair -- being fair does not mean everyone gets the same thing, but each gets what they need in order to have equal opportunities to succeed. Be Responsive -- listen, watch, and pay attention to student's words, mistakes, and behaviors. No students come to school thinking [about] what they can do to upset the teacher or friends that day. Something happened. Find out what is it. Be Caring -- "No one cares how much you know until they know how much you care." Why should anyone listen to you if you do not care about them? Everyone ought to matter. Each of these dispositions are applicable to general education teachers as well as any parents. What are some of the challenges you face in teaching different types of students? No two students are alike, so I love opportunities to figure out what I can do to reach each of them, whether academically, emotionally, physically, or socially. I don't look at them as challenges but rather as opportunities to get to know someone and for my own personal growth and development. Each chance I get to work with a different type of student is another opportunity to discover who I am and what kind of a teacher I can be. What was the job search like after completing your master's degree in special education? I had many job opportunities, even prior to officially graduating, because of my area of concentration in learning disabilities. It is the largest category of students being identified with special needs. It is also important to get yourself trained in as many aspects as possible [when it comes to] how to work with individuals with special needs, because oftentimes multiple factors, internal and external, could affect the student and hence focusing on the "label" itself may not be as effective when working with these students. Did you feel fully prepared when making the transition from student to professional? I'm not sure how prepared I was but I keep on finding ways to learn something new every day. Even with a Ph.D. and 16 years of experience, I still regard myself as a student. The only difference is I am my own teacher now instead of someone else. I teach myself every day and try to improve in doing a better job rather than in trying to change students' way of learning or their behavior. The most effective teacher is always a learner first. Why did you choose to teach at the college level? I love teaching in the classroom, but as a professor I get to influence prospective teachers from the onset. I get to train future teachers and then see them apply what they have learned as I observe them in the classrooms. I also love to examine my own teaching through research and [by] investigating what works and does not work, so I can extract evidence and continue to improve myself and contribute to the field. It's a never-ending ripple that serves the best of all worlds! What changes would you like to see in future curricula for a master's in special education? Interpretation and usage of data in diagnosis of conditions, pedagogical interventions, and administrative decision making. I've witnessed too many incidents of arbitrary instructions without data, all at the expense of our students' learning, their time, and their lives. Mental health training for all teachers, particularly those working with students with special needs. Sometimes, school itself is the problem [causing] the student's mental breakdown, and yet we don't spend enough resources and time teaching our teachers in preventive mental health. Advocacy engagements and inclusion of parents and the communities. Train teachers to become LEADERS in building partnerships and triangulating community support in collaborative education. Don't let schools do this alone. We all ought to be advocates for our children. Special educators are not second-class teachers. We are the leaders in working with the most challenging students. We need to be the voice for the voiceless. Self-care for educators. Educators cannot "lift" students up unless they are standing on a higher ground. Our profession does not emphasize self-care enough. That's one of the reasons for teacher burnout and dropout. As the demands on schools increase, teacher stress also increases. If we don't start teaching self-care to our teachers, we are going to experience more attrition than any other field. Co-teaching has been an age-old concept that has never been fully migrated into the general education curriculum. Higher education curricula are still in the mindset of "separate but equal" in terms of quality, collaboration, and learning outcomes. Unless teacher-training institutions start to embrace and demonstrate how authentic co-teaching is to take place in the classrooms, teacher-candidates are going to leave their programs thinking teaching is a "lone" job and that they are supposed to be equipped themselves with all the skills to manage the class and still produce the results. What advice would you give to special education students who want to get the most out of their collegiate studies? What resources or experiences can they take advantage of to give themselves a head start? Excel in your content areas regardless of whether you're teaching elementary or secondary level. You cannot develop pedagogically if you lack content depth. Don't treat teaching as simply a major you study in college. It is a lifetime pursuit of knowledge, so learn as much as you can and then go deeper and further to nurture that knowledge. Be your own self-critic and inspect your own learning. If you don't know how you learn, you'll have a hard time teaching others how to learn. Dare yourself to ask for honest feedback. Take into consideration everything, but sift out where you need to grow first. If you wait until you have your own classroom to start thinking about your own teaching, you may have missed too many opportunities to become that effective teacher from the first day of class. Affiliate yourself with one or two top professional organizations, such as the Council for Exceptional Children -- the largest professional organization for children with disabilities -- plus a local network where you are going to be licensed. College is not just about getting a good GPA; it's also about getting to know people at the professional level. Joining a community of educators who share your same passion and career path is one of your greatest assets. Participate in advocacy events. There is where you hone your leadership skills into actionable causes. Being an advocate does not mean being adversarial. In fact, it's the opposite. It teaches you how to work with people who may have different priorities and opinions than you but are still willing to hear your voice because you made them pay attention to your cause. Sometimes, students think being a special educator is to take a back seat to the general ed teacher, but that is not true. If you do not learn to be an advocate for your students, many of whom are often voiceless themselves, then you are not doing a very good job being their teacher at all. Conduct yourself professionally. You are not in college merely to learn how to teach. You are in training to become a professional, so act like one. Pay attention to how you dress, talk, manage your time, interact with your classmates and professors, and initiate actions. You cannot turn yourself from a student into a teacher overnight. Learn to develop the disposition for the kind of teacher you hope to become by starting to do whatever it takes from the first day of college. Conduct yourself with utmost integrity, genuineness, audacity, maturity, and tenacity. Whether you decide to be a teacher or not, you will be a better person for having developed these attributes. Many students with disabilities are first assessed when they reach kindergarten or elementary school, which usually spans grades 1-6. Elementary-level special education teachers evaluate their students in order to create individual education profiles (IEPs) that the student's parents and future teachers use. Special education teachers often instruct students outside their normal classrooms in dedicated SpEd classrooms. Careers This Concentration Prepares For: Special education teachers who plan to work with children in kindergarten and grades 1-6. At the junior and high school levels students with disabilities continue to receive aid and support from teachers as they tackle more advanced learning subjects. Secondary-level special education teachers typically provide supplemental instruction for students with mild disabilities and primary instruction for those with severe disabilities. They may also provide resources to older students for attending college or finding post-graduation employment. Careers This Concentration Prepares For: Special education teachers who plan to work with students in grades 7-12. Special education intervention often benefits children with disabilities in the years leading up to kindergarten. Early childhood special education teachers specialize in assessing children younger than age five, often with limited communication skills. This specialization also prepares teachers to explain and work with parents of young children with disabilities. Careers This Concentration Prepares For: Special education teachers who plan to work with pre-K students. This concentration specifically addresses the different disorders that comprise ASD, including autism, Asperger syndrome, and childhood disintegrative disorder. Teachers learn how to evaluate children for ASD symptoms, which may be present at a very young age, and instruct students in an engaging, stimulating manner. Careers This Concentration Prepares For: Special education teachers who plan to work at any grade level, along with curriculum developers. Special education technology concentrations introduce various tools, software programs, and other resources widely used in special ed classrooms. These platforms focus on different physical, emotional, and behavioral disabilities. In addition to the proper use and application of these programs, this specialization may also illustrate how to develop, design, and implement them. Careers This Concentration Prepares For: Special education teachers at any grade level, curriculum developers, or educational software designers. IEP Development and Implementation: This course prepares students to create and maintain IEPs for students at any grade level and tailor them to their respective disability category and severity. The course also covers the concept of cross-categorical inclusion, which proves fundamental to student success in special education. Instruction and Intervention with Special Populations: In this course, students learn about intervention practices and strategies for students with different disabilities, ranging from mild to severe. Case studies, statistics, reports, and laws governing special education illustrate the effectiveness of these different approaches. Special Education Administration: This course discusses both common challenges associated with integrating special education students into school classrooms and some of the required human and material resources. Students also learn about the duties and responsibilities of school administrators, along with the financial demands of special education. Social, Legal, and Ethical Issues in Special Education: This survey course covers the various standards and guidelines in place for students with different types of disability. Specific topics include past and current legislation, multicultural classroom management, special education funding, and ethical approaches to educating students with disabilities. Advanced Assistive Technology: Most special ed master's students take introductory courses in assistive technology as undergraduates. This course builds on the fundamentals by tackling both the concept of universal design for learning (UDL) and the methods of incorporating UDL principles in classrooms using low-tech and high-tech means. How Long Does It Take to Get an Online Master's in Special Education? According to U.S. News & World Report, standard online MA special education programs span 36-40 credits. Students can complete the degree in roughly two years. However, many special ed master's online pathways fall outside these parameters. Accelerated master's in special education degrees consist of condensed courses that students can normally complete in 18 months or less. Alternatively, online special education master's programs with licensure generally take longer than two years due to practicum and student teaching requirements. Other factors may also affect the completion time of online special education graduate programs. Some programs offer cohort-based learning, meaning that students begin their studies as a group and progress through courses together. These pathways tend to require more time than asynchronous or self-paced programs, which students can complete on their own timetable. Additionally, students who enroll full time typically graduate faster than those enrolled part time. Accreditation status serves as an important consideration for master's in special education online students. Accreditation refers to a comprehensive assessment process that colleges and universities undergo to demonstrate quality education and positive student outcomes. Schools that hold accreditation offer certain advantages to students who attend, such as eligibility for federal student aid and the ability to transfer credits to another institution. Accrediting agencies perform the evaluations that lead to accreditation. Regional accreditation typically applies to four-year institutions that specialize in liberal arts and sciences programs. National accreditation, on the other hand, typically applies to professional and vocational schools. The third type of accreditation, programmatic, goes to individual schools at larger colleges and universities that specialize in certain subjects, such as education, nursing, or law. Master's in special education students should ensure that their school and their program hold full accreditation. Programmatic accrediting agencies for special education programs include the National Council for Accreditation of Teacher Education and the Teacher Education Accreditation Council, Accreditation Committee, which both evaluate K-12 teaching programs including special education. Two separate organizations recognize accrediting agencies and oversee the accreditation of colleges and universities nationwide. The U.S. Department of Education (ED) creates and administers education policies throughout the country, collects data for schools and student demographics, and coordinates federal student aid. The Council for Higher Education Accreditation (CHEA) specifically focuses on evaluating and providing accreditation to postsecondary institutions. The CHEA includes more than 3,000 colleges and universities. The ED and the CHEA maintain lists of fully accredited colleges and universities. According to PayScale, the median annual salary for special education teachers matches the earnings of regular teachers at the elementary, middle, and high school levels. Directors of special education and other supervisory roles that require more experience typically earn higher salaries. However, earnings for special education teachers depend on several factors, including their experience level and the state, city, and district where they work. The table below lists median annual salaries for five occupations associated with the master's in special education degree, as well as their career salary growth over 20 years. Depending on their specialization, students who graduate with a master's in special education online may go on to pursue teaching roles at the elementary, middle, or high school level. In the U.S., public schools require teachers at all grade levels, including special education teachers, to hold licensure. With experience, special education teachers may advance to positions such as principal, instructional coordinator, or school counselor. Important skills for special education careers include communication, resourcefulness, and interpersonal effectiveness -- as well as patience and stress management. Like other teachers and school staff, special education teachers generally work roughly 10 months out of the year. Special Education Teachers: According to BLS, 86% of special education teachers work for public schools and 7% work for private schools. Other potential employers include the student's residence, group homes, and medical facilities. Kindergarten and Elementary School Teachers: Kindergarten and elementary teachers focus on foundational skills in subjects such as reading, writing, math, science, and art. They also work in tandem with special education teachers to assist students with disabilities and other exceptionalities. Middle School Teachers: Middle school teachers lead intermediate classes in subjects such as English, history, math, science, and physical education. They normally teach individual classes with different groups of students throughout the day and work with special education teachers to integrate students with disabilities in classroom activities. High School Teachers: High school teachers lead advanced courses in core academic subjects and prepare students for life after grade 12. Like middle school teachers, they lead different groups of students in individual classes. They also consult with special education teachers to ensure the inclusion of students with learning disabilities and emotional or behavioral disorders. Professional organizations offer a great entry point for students who want to learn more about their chosen career path. Below, you can find three of the country's most prominent organizations for special education professionals. These organizations host networking events, provide online trainings, maintain active job boards, and offer other services for career-ready college graduates. National Association of Special Education Teachers: According to NASET's mission statement, the organization strives to "render all possible support and assistance to professionals who teach children with special needs." Member benefits include discounts on continuing-education courses, complimentary online journal subscriptions, free webinars, and a comprehensive list of local and national conferences targeted toward SpEd professionals. Council for Exceptional Children: Founded in 1922, CEC is an international organization that provides "advocacy, standards, and professional development" to professionals working with gifted young people. Students receive a 20% discount on membership fees, while professionals currently living in developing countries may become members for only $50. Autism Society of America: Special education teachers make up some of the more than 120,000 members belonging to this Maryland-based nonprofit organization. The ASA's website features a wealth of academic and scientific resources related to autism spectrum disorders, as well as information about current advocacy projects and upcoming events. Despite the relative affordability of online programs, most students still need financial assistance. Students should complete a Free Application for Federal Student Aid (FAFSA) form to learn more about loans, grants, and other opportunities offered through the U.S. government. Additionally, students receive private grants and scholarships through nonprofit organizations, companies, and other sources. Check out our collection of resources below to learn more about your financial aid options. Approximately two-thirds of today's college students rely on loans to fund their education. Students can also receive help through grants and scholarships. Completing the Free Application for Federal Student Aid (FAFSA) proves a crucial first step for any student with financial needs. Our FAFSA guide features a step-by-step rundown of the application process and answers several frequently asked questions. Students attending online and on campus receive the same financial aid opportunities. Click the link to find out about opportunities available to online students. Online programs can provide an affordable and flexible option for women trying to balance the demands of work, family, and earning their degree. We've curated a list of scholarships specifically for women. Online college programs offer a flexible, affordable option for single parents interested in earning a degree and securing their family's financial future. We've compiled a list of scholarships, grants, and other financial aid options geared toward single moms and dads. U.S. military personnel enjoy access to millions of dollars in free money. Learn more about grants, scholarships, and other financial aid opportunities available to veterans, active-duty service members, and reservists.